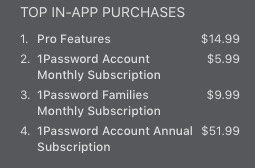 I see 1Password 6.7 is now offering a standalone macOS license on the Apple App store at $99.99 (AUD) Is this cost per annum or per version or what? If I buy the macOS standalone license then I need to buy the iOS Pro Features license at $14.99 (AUD) from the App store. Then with these two purchases I can sync my Mac with my iPhone and iPad via iCloud or Dropbox? @toasted: This isn't anything new. The App Store still has a standalone purchase (for that version, as always) that works with local vaults. Correct. Each standalone version is a separate purchase. Yep! An easier (and frankly more affordable) option is a 1Password.com membership, since it includes all of the apps, automatic offsite backup (and item history), and no sync configuration or licenses to manage, but what you suggested could work too. Cheers!